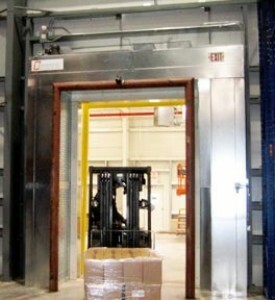 Single Horizontal Recirculatory Air Cooler/Freezer Door | Dock Door Systems Inc. Welcome to the next generation of door technology with the new "invisible" AirSeal air door from Enviro. There's no door damage or downtime due to forklift impacts, no more waiting for doors to open and close, and virtually no maintenance. And that's just the beginning. AirSeal’s invisible barrier allows for unobstructed traffic flow with minimal loss of refrigeration and/or heat gain. Significantly reduces fog, ice and moisture associated with wide-open doorways. Adjustable and programmable air speed controls, allowing for precise application settings. Integrated self-regulating EPLC controlled heater unit for optimal air mixing temperature control and condensation reduction. Reduction of ice, fog and moisture dramatically increases safety and material handling. Fully programmable logic controller with preset modes for maximum energy cost savings. AirSeal - 4,600 cfm at 4” of water gauge.